Canadians might be setting themselves up for a bright future and a comfortable retirement. But how are they going to pay the bills today? What about pressing expenses that are stretching budgets thin today? I would pump the breaks before we get into the territory of feeling financially bulletproof. Amid the usual torrent of news stories about record-high household debt, recently I read that the $1.85 trillion dollars that we collectively owe pales in comparison to our rising collective net wealth of $10.2 trillion. Interest rates are low, the stock market is bullish, and strong real estate has made unsuspecting millionaires out of some Canadians. Sure, Canadians might be setting themselves up for a bright future and a comfortable retirement. But how are they going to pay the bills today? What about pressing expenses that are stretching budgets thin today? In September 2014, the Canadian Payroll Association pointed out that half of Canadians are living paycheque-to-paycheque. Unless they dip into their RRSPs or move to a cabin in the woods, that stat is unlikely to change very much. The worry here, is that our increased net wealth might be giving us an inflated sense of spending ability. Those that have seen their net worth increase are welcome to feel a sense of pride and satisfaction -- but these numbers are just statistics, after all, and plenty of people haven't been so lucky. I would pump the breaks before we get into the territory of feeling financially bulletproof. Alberta is providing us with a case study of what happens when times get good, we live large, then times get not-so-good, and we find ourselves wondering how we're going to be able to pay our creditors. Last summer, Environics reported that the average Albertan's net worth was a whopping $531,067. Their hefty household debt, an average of $124,838 according to BMO's annual debt report, looked perfectly manageable. Fast forward to the oil shock of recent months -- January saw 14,000 jobs lost and an Albertan unemployment level at its highest since 2011. 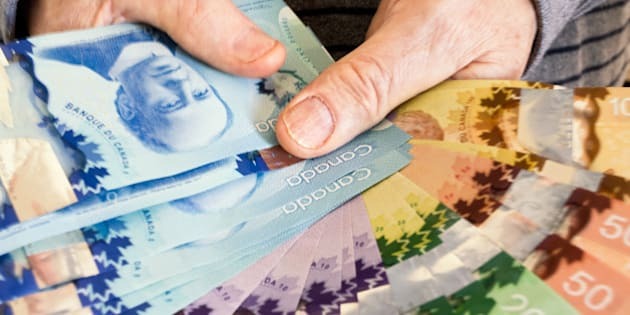 Last month, my organization saw an increase of 38 per cent in clients from Alberta, seeking help with debt, compared to the same time last year. I'm not saying the sky is falling -- it's not. But, money still isn't growing on trees. If we start living beyond our means, we will stretch ourselves too thin which will make us vulnerable to even the slightest bumps in the road. Speed up your debt repayment. One way to free up extra cash is to eliminate your debts. Adding just a little bit extra to your repayment schedule will speed things up and save you money. Try a credit card debt calculator and see for yourself. Live well within your means. Just because you can afford it today, doesn't mean you should buy it. Be conservative and leave yourself a nice buffer of savings to cover three to six months' worth of expenses. Who knows what will happen tomorrow. Get out a fine-toothed comb. I'm always surprised at the amount of people who don't track their spending. Download your credit card and debit statements and put your spending into categories so you can see exactly where your money is going. I can almost guarantee there will be a few results that shock you. Automate your savings. Pay yourself first by having a set amount go into your savings account. This will take the human error -- make that, the human temptation to spend -- out of your savings plan.